This eagle died after eating poison in the San Luis Valley in 2017. 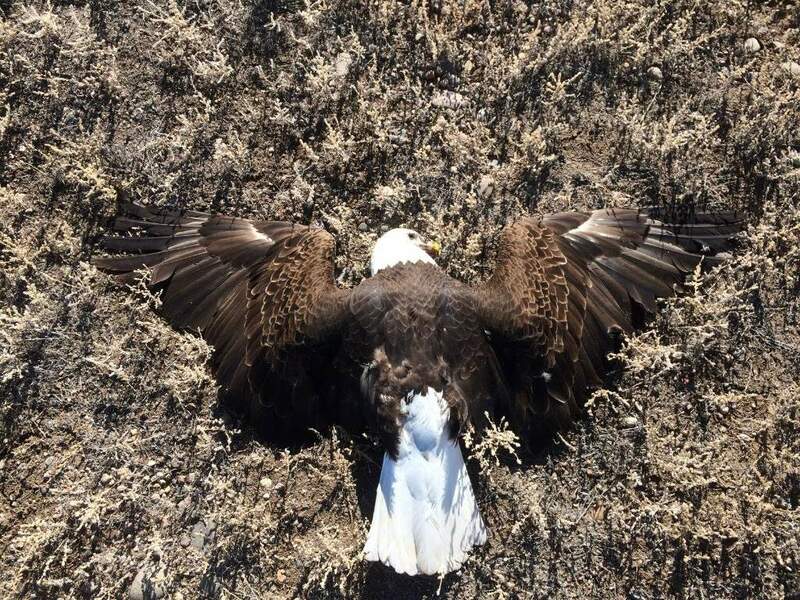 A Rio Grande County man has been convicted of poisoning bald eagles in the San Luis Valley, according to Colorado Parks and Wildlife officers. John L. Divine, 77, pleaded guilty to 10 misdemeanors illegally killing or poisoning wildlife and paid $8,283.50 in fines in April. Divine said he targeted coyotes for killing his sheep. Five bald eagles, a coyote, a fox, magpies, crows and ravens were poisoned, CPW officer Jeremy Gallegos said in a press release. The investigation started on Jan. 13, 2017, when a tipster in Saguache County said he’d found parts of a domestic sheep that appeared to be covered with poison. Gallegos found the poisoned bait and seven dead magpies. The next day, he found more sheep pieces and tire tracks, and set up a game camera. He returned to the site again and found a poisoned sheep’s liver and another dead magpie. He also retrieved the camera images, which revealed a white truck and a man who carried the liver. On Jan. 21, Gallegos and another officer spotted the truck and pulled it over. “I told him that the poison could kill more wildlife, including raptors,” Gallegos said. Divine said he was trying to stop the coyotes and that he’d put anti-freeze on the sheep. After questioning, Divine admitted baiting two locations, and he was cited. Divine paid a fine of $362.50 on Feb. 7. On Feb. 3, the case widened with CPW officer Tony Aloia recovered a sick eagle, then found carcasses of two eagles, a coyote and a red fox. A third dead eagle was later found in the area. The injured eagle was nursed to health at CPW’s wildlife facility at Frisco Creek, and released into the wild on March 30, 2017. Two additional dead bald eagles were retrieved in March by Wildlife Officer Luke Hoffman. U.S. Fish and Wildlife Service testing labs on the Front Range found that the banned pesticide Furadan had killed the eagles. “The evidence clearly showed that all these animals were killed by the pesticide put out by Mr. Divine,” Gallegos said. Gallegos continued to investigate, and in November met with Divine’s attorney and served the citation with the new charges. Divine admitted guilt and eventually paid the fine. Gallegos credited landowners for reporting the apparent poisonings. “It goes to show that we all can be a voice for wildlife,” he said.